Steve has been writing and narrating stories for children for many years, as well as singing and doing music projects with them. When he’s not writing he may be found mentoring and training teachers of English as a Foreign Language. If he’s not doing either, more than likely he can be found making music by playing guitar or keyboard or maybe travelling. 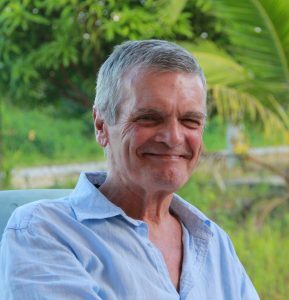 Steve currently lives in Kuching, Sarawak (Malaysian Borneo) although he gets back to the UK quite regularly where his grandchildren, Joe and Millie, enjoy listening to his stories and sharing their own. Seeing the delight that children can get from books and as an English teacher, knowing the benefit they gain from both reading and having stories read to them. It varies, but I usually have a ‘hook’ which starts me off. That may be simply be the title which leads onto the story or it may be ideas for characters and outline for a plot that are the catalyst. Writing the first few paragraphs creates the mood and motivates me to develop the characters and the story. I find it helps to get into a childlike mood! I usually have an idea of where the story is going, but that can change as I write and introduce more twists and turns. I have written stories for narration in the past which involved speaking in the characters’ voices. I still sometimes read out loud to hear how they sound. The characters are very much allive in my imagination. Get something down on paper quickly and make a start rather than spending ages just thinking about it. As my books are beautifully illustrated, self-publishing with Amazon is now a much more attractive route as I can publish a print versions in addtiion to Kindle. It is becoming increasingly competitive with so many self-publishing authors saturating the market. What genres do you write? : Illustrated stories for young children, historical fiction for children.